Shining Netvein Barberry is primarily a foothill plant, appearing in Yosemite itself only at the park's lowest elevations, generally below 4,000 feet. The clusters of yellow flowers have a strong, pleasant aroma; it's worth getting down on your knees for a deep whiff, but avoid poking your nose into the leaves, which have sharp points cunningly arrayed along their perimeters. 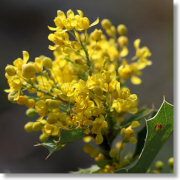 This plant grows only in California, and out of the hundreds of members of the Barberry family worldwide, it's the only species to grace the Yosemite area. You can call it the John Muir of Berberidaceae if you like; the plant will not object, and neither will Mr. Muir. 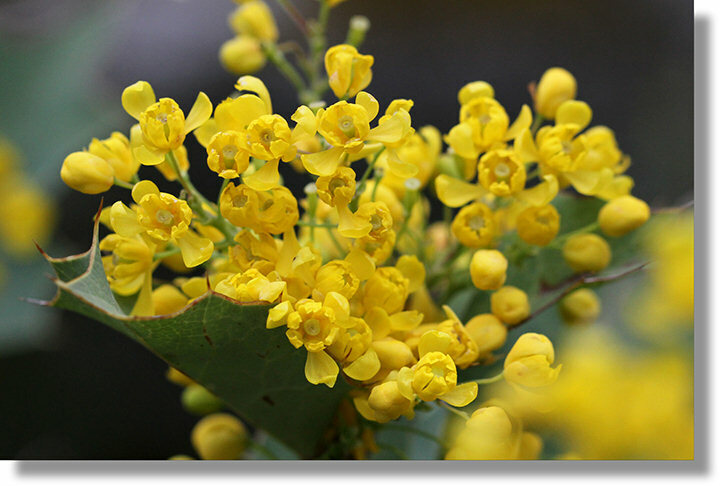 Berberis aquifolium etymology: Berberis comes from the Latin word for barberry, barberis. Aquifolium is a variation of the Latin word acrifolium, which means to have holly-like leaves. Dictyota means latticed or net-like, probably referring to the intricate patterns of veins in the leaves.